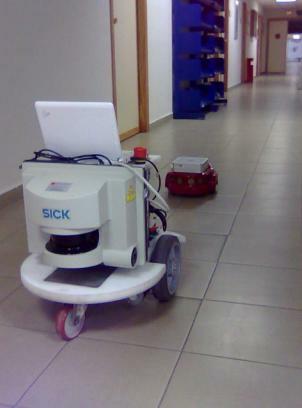 In this mission there are involved two robots; the leader (Morlaco) and one slave robot (Roomba). The leader guides the slave through the corridor. When it detects a door, it sends a position inside the room to the slave. The slave stops following the leader and starts its task. In this mission there are involved three robots; the leader (Morlaco) and two slave robots (Roomba). The leader guides the slaves through the corridor. When it detects a door, it sends a position inside the room to one slave robot that starts its cleaning task. The other slave robots continues following the leader robot: (video).